To knit a tube on the Bond, you would use the intarsia keyplate in the carriage minus the wire yarn guide. You can make it any width you want but you would want to use an uneven number of stitches. 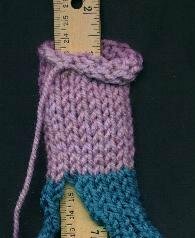 If you were to knit a sample of, let's say, 19 stitches, ten of them would "belong" to the back of the tube, nine would belong to the front. 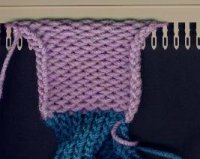 At the end of the knitting you will need to reform each stitch that belongs to the front to a knitted stitch. You will really get a tube that has been knitted on every other needle. You can start with different cast-ons such as e-wrap, crochet cast-on or an open cast on (to do this, knit two separate pieces of waste yarn on every other needle, one over 10 EO needles, one over 9 EO needles, then hang the one that has ten stitches on the odd numbered needles, the one that has nine stitches on the even numbered needles. 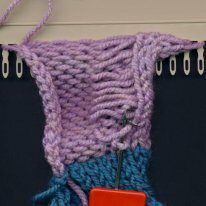 If you use an open cast-on, you would have to bind off that edge at the end). Let's use the e-wrap cast-on for this sample. Bring to holding position needle 1 and all odd numbered needles through needle 19. E-wrap those from left to right. Now pull those needles to forward working position, leaving the others against the bed, and knit them.� Reform them to knit stitches and check to make sure they are not connected to the stitches on the alternate needles.� At this point, I hang the bobby pin cast-on comb with the weighted hem between the needles. If you don't have one and didn't start with an open cast on and weights on the knitting, you would want to use claw weights.